Cement ball mill is mainly used in the grinding of finished products and raw materials in cement plants. It is also suitable for industrial and mining enterprises such as metallurgy, chemical industry and electric power to grind various ores and other grind able materials. 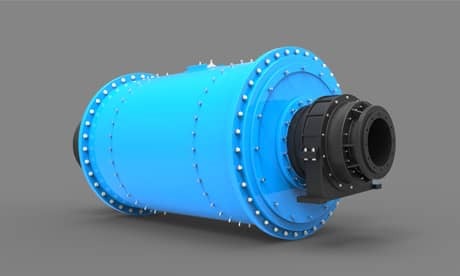 The ball mill consists of six parts: the feeding device, the supporting device, the rotating part, the unloading device, the transmission device and the lubrication and cooling device. 1. Ordinary cement ball mill: Most of the cement ball mills used in the circulating grinding system is characterized by high grinding efficiency, large mill output, and low power consumption. Especially when grinding slag cement, the performance is more prominent. The general mill output can be increased by 15-20%, the power consumption is reduced by about 10%, and the finished product temperature can be lowered by 20-40 ° C, and the product fineness can be easily adjusted. 2. High-fine and high-yield cement ball mill: The fine-grained cement ball mill is mainly used in the open-flow grinding system. The utility model is characterized in that the system equipment and the process flow are simple, the investment is saved, and the factory floor space is small; the advanced internal selection powder special compartment device is used on the structure of the mill, the activation device is added to the fine grinding bin, and the special tailing is provided for the grinding tail. The seesaw minimizes the size of the grinding media in the grinding chamber, greatly improves the grinding efficiency, and achieves the goal of high output and low energy consumption. The company specializes in the production of ball mills, dryers, rotary kiln and its complete sets of equipment, lifting hooks, large transformer tanks, mud pump casings and steel structures, including fly ash ball mills, ceramist sand rotary kiln, metallurgy. Rotary kiln, cement ball mill manufacturer, widely used in cement, chemical, metallurgy, mining, thermal power generation and other industries. Relying on the strong forging and machining strength of the parent company, it realizes the integrated production of many forging parts. The company's processing equipment is complete and advanced, the assembly process is strict, the product quality is excellent, and it is at the leading level in China. The products are exported to more than 20 provinces and cities and Southeast Asian countries. Working principle: cement grinding is a horizontal cylindrical rotating device, external gear transmission, two warehouses, and lattice ball mill. The material is uniformly fed into the first chamber of the mill by the feeding device through the hollow shaft of the feeding material. The chamber has stepped lining or corrugated lining, which is filled with steel balls of different specifications. The rotation of the cylinder generates centrifugal force to bring the steel ball to a certain height. After falling, it produces child attack and grinding effect on the material. After the material reaches the first warehouse rough grinding, the cement ball mill enters the second warehouse through a single-layer compartment board. The warehouse is provided with a flat lining plate with steel balls inside to further grind the material. The powder is discharged through the discharge raft to complete the grinding operation.